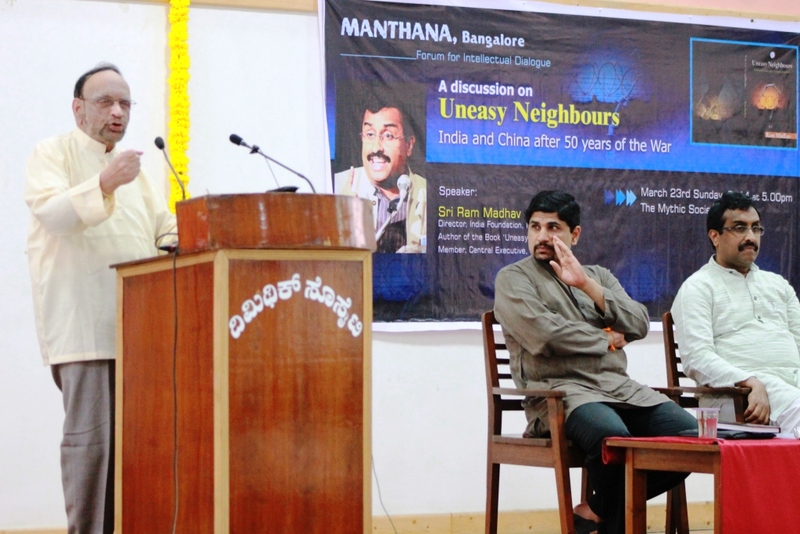 Bangalore March 23, 2014: RSS Senior Functionary Ram Madhav addressed a gathering this evening at the Mythic Society Auditorium at Bangalore, on his new book UNEASY NEIGHBOURS, India and China after 50 years of the war. The programme was presided by Sreedhar Rao, an expert of national security issue, who was former chief secretary of Sikkim. 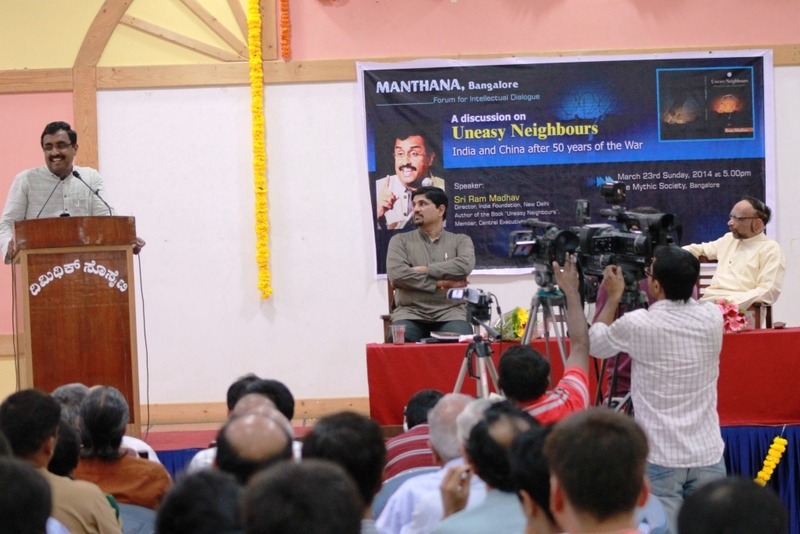 The event was organised by Manthana, a forum for Intellectual dialogue in Bangalore. 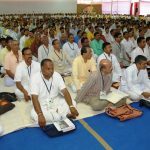 Nearly 200 selected intellectuals attended the event. The event started with a soulful rendition of the immemorial song ‘Aye mere waten ke logo’ by an upcoming singer, Ohileshwari. 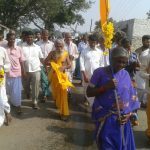 Shri.Ram Madhav was born in East Godavari. Primarily a student of Electronics & Electrical Engg., he secured a Post graduate degree in Political science from the University of Mysore. 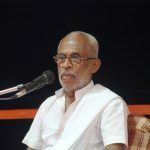 He is also the member of central executive of the RSS. 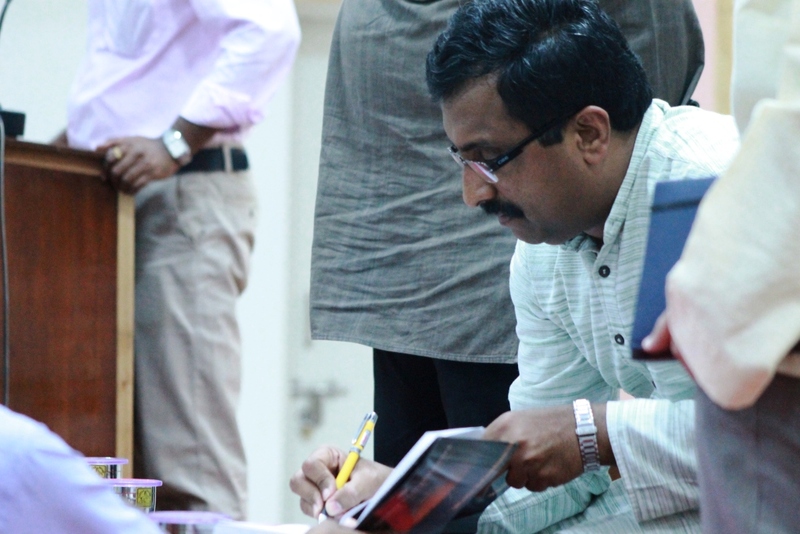 He has authored 12 books, in Telugu & English, and contributes to various newpapers and magazines as a columnist. He has travelled extensively, in over 20 countries. He was also a journalist from 1990 to 2001. He is currently the Director of Indian foundation. Shri.K Shridhar Rao, a reited IAS officer, has an MpHil in economics from London School of Economics. He was also the member of National Security Advisory Board and was the Addl. Chief Secretary of Assam. 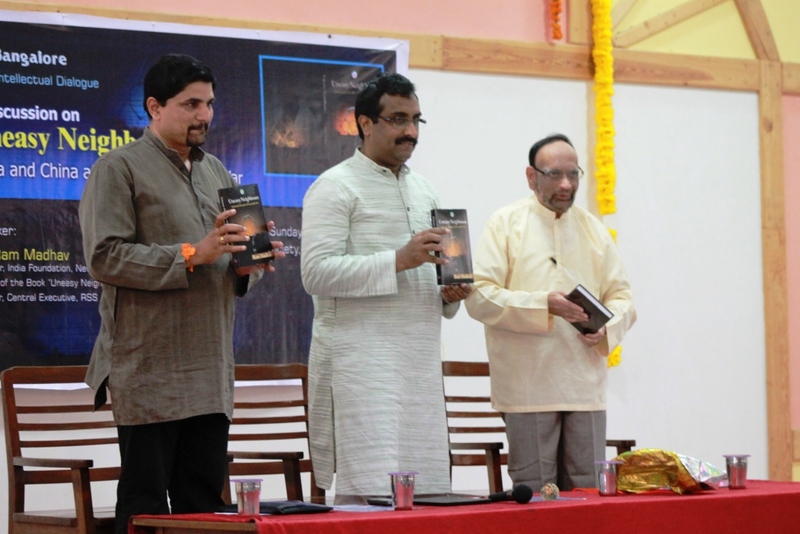 Ram Madhav’s book ‘Uneasy Neighbours’ was released by Shridhar Rao on the occasion. 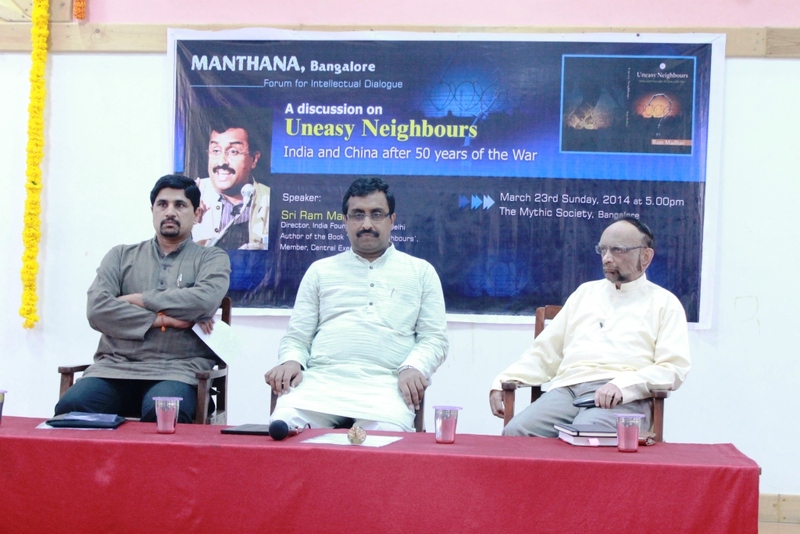 “China was not technically a neighbour for 5000+ years and this fact has been highlighted in the book by Ram Madhav. He takes you from China where 4-5 crore people where killed by Mao to India’s historical linkages with China. India had a Post office and a defence base in Tibet. He has also mentioned the all important letter of Sardar Patel on China’s possible attack on India which was ignored by Nehru. Shri.Aurobindo had also predicted the Chinese misadventure. But Nehru ignored all their warnings. There were 3 key people who were responsible for the loss to China. One is Nehru. 16 days before the war, Nehru was talking with the Chinese premier but did not realize the gravity of the situation. Even after the 1962 war, India has not achieved much in terms of its ties with China for the last 50 years. 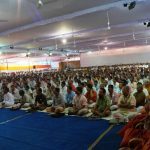 “This event is as per what the Rig Veda which says let all noble thoughts come from all sides. Ram Madhav’s book is a extraordinary one. We also need not have a uneasy relationaship with China. 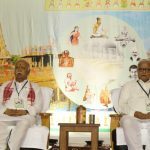 Civil soceity nor press does not give the importance it ought to but this conclave has given the opportunity to discuss this all important subject. WWII was the last occasion where nations dealt with each other through the armies marching across each others terrotories. Today, nations try to get at each others throat without the other knowing it, through economics and other ways. China takes much of its inputs from Sun Tzu a military starategist of ancient China. Despite this CHina is also facing restive populations within, like in Kunming. There are reports that suggest that peopl have a problem with the Communist Party of China for grabing land of the common people. Regarding our own relationships with China, we need to be wary of the ‘String Of Pearls’ where China is trying to set up strategic bases in 9 odd locations across the Indian ocean. India faltered in accpeting the China nominated Karmapa in Sikkim. We should also be concenred about the growig ties between China and Nepal hich poses a threat to India. India has a weak point in Aksai China as it was not part of British India nor of the princely state of J&K. If we sit across the table we will be able to sort out most border issues. China wants Tawang as they argue that the Karmapa was born there. 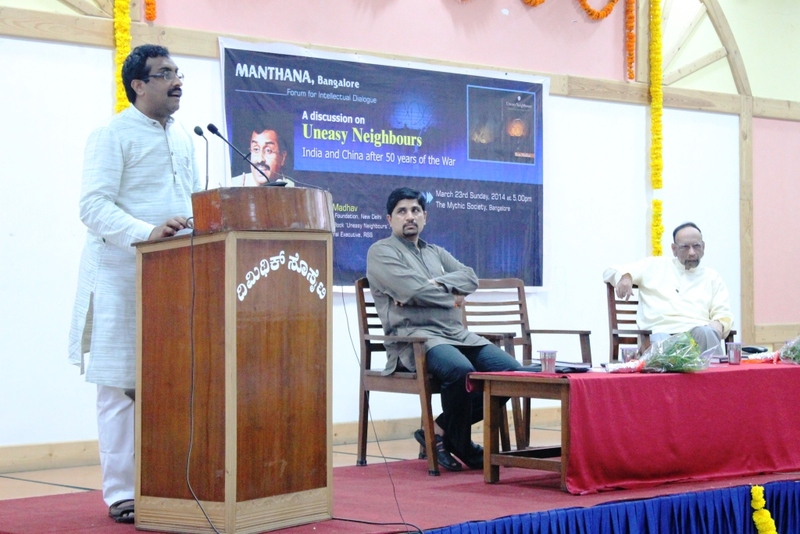 Shri.Ram Madhav delivered his lecture on ‘Uneasy Neighbours’. Following are a few excerpts from his lecture. “The book is a output of my discussions with learned experts like Shridhar Rao ji and many others. I have had the opportunity to visit China a couple of times. I have also had the privilege to visit Lhasa, a very rare opportunity and vist the ancestral home of his holiness Dalai Lama. This book is not a fiction and contains an idea. The whole purpose is to promote that idea. The central question of the China-India realtions has a long history. We are made to believe by our governments that India & China had relationships and cultural linkages for thousands of years. We have also been described by several historians that we are cultural cousins. Even to this day the general idea in majority of Indians is that of a friendly neighbourhood. When Hu Jintao visited India in 2010 he said India and China have been good friends in History for 2000 years and our relationship soured only after 1962. The is partly right and partly wrong. This is because we never shared our borders as we had a buffer state in Tibet which lay between India and China. China became our neighbour only in 1952, this is after it annexed Tibet in 1950. Tibet gave a call for help to many countries including India, Britain and US. But they realized that no one would come to their rescue. When China annexed Tibet, India never protested. No one stood up and said that whats happening with the Tibetians was wrong. Despite the hoary ideals and values India stood for, India never supported Tibet and even refused to support a resolution in the UN that condemned the occupation of Tibet. Nehru did not even respond to Sardar’s letter cautioning him over China’s moves. Infact a small country, El Salvador stood for the resolution but even then Nehru made sure that El Salvador never voted for the resolution. The reason given by Nehru was that India requires the support on China in the UN. When the Korean crisis escalated in 1949, China supported North Korea but US and other western countries supported South Korea. Nehru had convened a special session of the parliament to discuss the Korean crisis. When asked why not a session on Tibet he had said that the solution for Tibet is simple, meaning that we had to ignore the issue. When China marched ahead in Tibet and constructed road links across our border with Tibet, China techinically became our neighbour. I am trying to submit through this book that although things have changed, the mindsets continues to remain the same. We Indians are idealists, simple at heart and truly believe to have good relationships with all our neighbours. Owning to this we treat all neighbours as same when no two neighbours are the same. In many aspects of International relations we are guided by romanticism, sloganeering and far removed from reality. Unfortunately International relations are all about realism and pragmatism. We have to be guided by our interests. It is here that 1962 becomes relevant as I propose in this book that we still do no understand our neighbour. 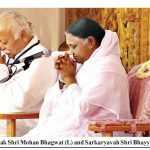 ‘Hindi Chini Bhai Bhai’ has become a article of faith but not based on reality. Despite several inputs from intelligence that China had intruded into our territoty, Nehru lied to the nation that there was no such information. We were hiding facts from our own people. If the talks fail, we should be ready to face any eventuality. But we were not even ready to face the consequences. Pannikar, the then ambassador to China, never gave any inputs about Chinese foray into Tibet to India and when asked why he failed he said he was pre-occupied with the issues in Formosa! We never accepted reality but when we faced the reality it gave us a big jolt, including Nehru. The Henderson-Brooks report is event today locked up and kept. The commision consisting of two Indian Army officers, Lieutenant-General Henderson Brooks and Brigadier Premindra Singh Bhagat, was instituted in 1963 and their report was submitted in the same year. We are in 2014 and still the report is kept a secret for 51 years and the govt. of India refuses to declassify it. Some parts have been released by the journalist Neville Maxwell. Till 1961 November, India did not have a road to link Leh to Kargil. During August 1962, Krishna Menon, who was our then defence minister, was asked how is our defence preparedness, he replied back by saying, “Defence against whom?”. He had even said that China will not attack as it was promised so by the then Chinese premier. But in November 1962 Nehru sent a long list of arm requirements to US. When journalists in Chennai asked about the reports of Chinese incursions, Nehru said he has instructed the Army to push the Chinese back. This was a blunder as the Chinese took this as a statement of attack. The idea to bring this book out is not to blame our past rulers but to highlight the fact ‘Know Thy Neighbour’, in which we have failed. Sun Tzu told the Chinese how to defeat the enemy without firing a bullet. Sun Tzu talks about containing the enemy through engagement. But we have never understood this strategy of the Chinese. Though Chinese are not expert in Chess, they play a game called ‘Wei Chi’ which is about encircling the enemy and stop any moves of the enemy. This is their mindset and approach. Even today when the government in China is asked about the border we are told that there is peace on the borders. But the facts are otherwise. We are made to believe that the LAC is the actual international border while this is false. We are told that there are no maps to prove that this is false but our government believes otherwise. There are maps of Tibet but the Chinese refuse to accept it as they say they have nothing to do with earlier Tibet. Even Raja Ranjit Singh also had maps but we have never acknowledged. When in 1986, Rajiv Gandhi’s said that we can freeze the current borders and focus on other issues and during that year’s winter our Army vacated the border posts. But the Chinese in 1987 had occupied the posts that were vacated by the Indian army in 1986. But owing to the due diligence by the them Army Commander, the Indian troops moved back and stood eye-to-eye for six years and help on to their positions. Then it was agreed that both armies have to go back to their earlier positions and India deemed this as a victory. In 1995, China modified its nuclear policy and though it said that they are for ‘No First Use’ but excepting India, meaning that they could bomb India anytime. When Vajpayee tried to solve the Arunachal issue with China, they again brought up the issue of Sikkim saying that it was not settled though it was settled in 1975. This is China and this is their strategy. As a famous joke goes, when god created the world he gave one quality/resource to each country but for India he gave a part of every quality to India. 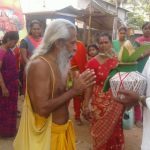 Narada told god that people will deem him to be partial to India to which god asked for an idea. 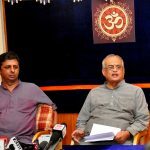 Narada said create Pakistan on one side and China on the other side and they will compensate for the riches given to India. Q: How do I as a citizen believe what the media says and what the truth is, as few believe that the ‘String of Pearls’ is a myth? A (By Shridhar Rao) : String of Pearls is a clear policy that is being used by China and response by the countries like Pakistan is also enthusiastic. Pakistan procures weapons and armaments from China only to attack India. We also have a failed foreign policy like in the case of Sri Lanka. Our foreign plicy is governed by our image and not by our interests. 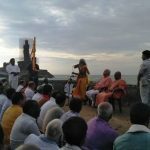 A (Ram Madhav) : Though media sometimes hypes up the news, it is also true that media has several times correctly reported the Chinese incursions. Ceasefire declared by China in 1962 war was disclosed by the media first when our governement did not know about it. Media has done its job most of the time of highlighting the right issues. Q : Why did Vajpayee concentrate on Arunachal Pradesh and did not ask China to get out of the occupied areas? Was NDA as weak as the UPA in handling border issues? 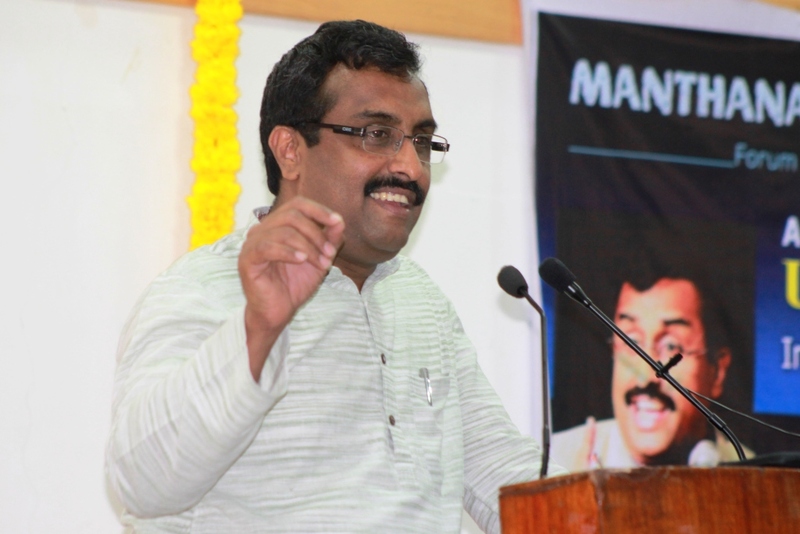 A (Ram Madhav) : Foreign Policy is a continuos process. In the case of Tibet, even Dalai Lama has also accepted that existance of Tibetian Administrative Region (TAR) as a reality. 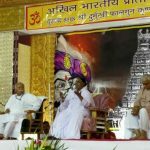 Indian governments only continued what was agreed by previous governments right from the days of Panchsheel, which was termed by Acharya Kriplani as ‘born in sin’. Q : What will you suggest the new government led by Modi, on making the relationships with neighbours easy? A (Ram Madhav) : Whichever governemnt comes to power we need a clear security policy. We need out-of-the-box thinking in our foreign policy. I beleive that Chanakya was the last strategic thinker from India. 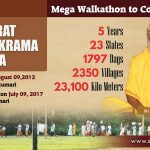 He had suggested Chandragupta Maurya to take care of many border republics. When he asked why it that necessary as there was no threats from them, Chanakya said Pataliputra is as safe as the border republics. Ashoka was also shrewd in planning for buffer states around Bharatavarsha in form of Buddhist nations which would be like a shield. PV Narasimha Rao was also a good strategic thinker who formulated the ‘look east policy’, who said we need to be moving towards the east when the world was looking upto US and Europe. He was a one who showed us that culture can be used as a diplomatic tool. China has done the same by setting up several Confuscious schools in many countries. 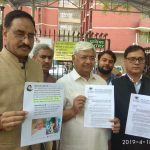 Though we have forumalted the policy we have not acted on it. We need to now act on the ‘look east policy’. All the eastern countries like Thailand, Taiwan, Mongolia should be good friends of India. We need to think differently and have out-of-the-box thinking in foreign policy and we hope the new governemtn will act likewise. A (Shridhar Rao) : Foreign policy has two aspects; ‘Congruence of interest’ and ‘conlfict of interest’. We need to work on increasing congruence of interest and reduce conlfict of interest. For any foreign policy to succeed, internal strength of a country also matters a lot. Q : While ‘look east policy’ is out of the box thinking, how will we manage the trade with the Chinese and other eastern countries. 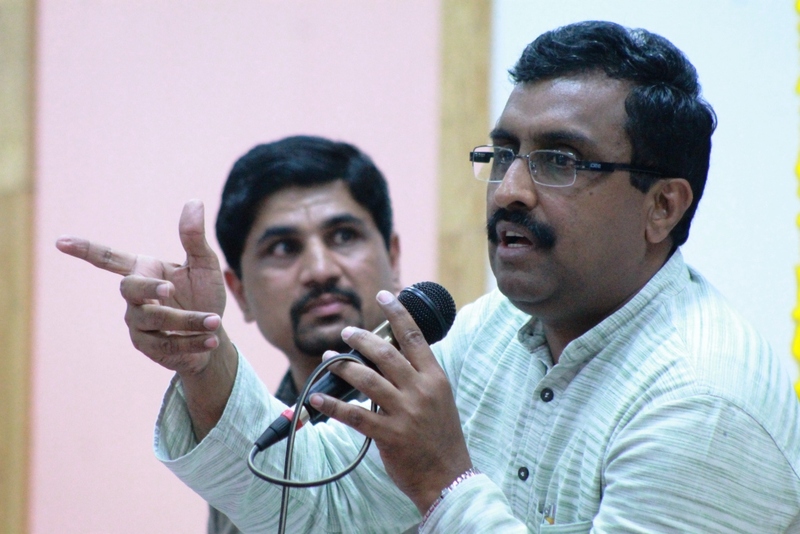 A (Ram Madhav) : Economic nationalism is required to safeguard our interests. We cannot become the dumping ground for China. While we export iron to China we import finished products. We also import steel from them. Why cant we setup a industry here to make steel? While we implement the ‘look east policy’ we need to take care that our interests are not harmed. We need to be careful while granting MFN status to other countries. Granting MFN to countries like Thailand, many Chinese products that are dumped in Thailand lands up in India. 40% of our Telecommunications equipments is supplied by the Chinese company Huawei, which can be a threat to our security. While we take care of our neighbours we also need to be aware of our national and security issues that might arise. Dr Giridhar Upadhyaya, convener of Manthana Bengaluru welcomed and introduced the guests to the audience. The event was hosted by the Mythic Society, Nrupatunga Road, Bengaluru. 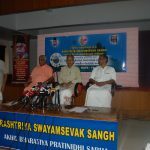 Rajesh Padmar, Co-ordinator of Vishwa Samvada Kendra(VSK) and Chief Editor Samvada.org was the master of ceremony. Editor of ‘Pungava’ Radhakrishna Holla delivered vote of thanks.